Setting up a modern entertainment system is, put kindly, a miserable task. Put less kindly there might be a few words thrown in that aren’t fit for print. Fragile and expensive flat screen televisions need to be bolted to wall mounts and then connected to a half dozen devices, each with its own positioning requirements. Then, once the installation is completed, god forbids you would want to change any of the connections or install a new device because often the ports are inaccessible without dismounting the entire television. Shudder then, at the thought of the family pet or even your own self accidently dislodging the HDMI cord. One would hope, or perhaps pray, that the can use a combination of kitchen utensils to try to get the cable plugged in again, however, too often the solution is to dismount the television, a hateful task, just to put plug in that one cable. This entire dilemma can be easily avoided by using Omtro’s Locking HDMI Cable. So simple that it seems criminal that every HDMI cable doesn’t have similar functionality, the Locking HDMI Cable does exactly what it says: it locks the HDMI cable into the device. 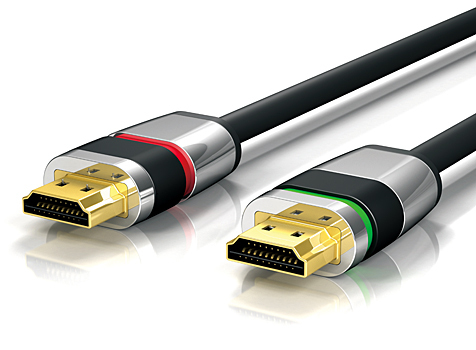 With a universal fit, the Locking HDMI Cable fits into every HDMI receptacle, with a 360 degree switch it works in all HDMI receptacle configurations and as the world’s first ATC certified integrally locking HDMI, it’s guaranteed to be of a higher quality than any non certified competitors. Why risk your sanity with having to be the electrical engineer that you aren’t, just lock the HDMI cables in place and never worry about the cables again. This is exactly what Omtro’s Locking HDMI Cable offers.